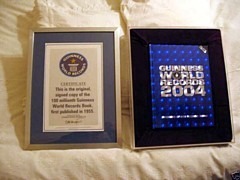 There are two distinct classes of "special" Guinness Book of Records. This page details the first class, which includes "Christmas" editions that were produced by Guinness for private distribution, editions sent as promotional gifts by Guinness, and standard editions that were produced as "deluxe" (or "soft back") editions for sale to the public. The second class consists primarily of private editions that were specially bound for companies to present to their staff and customers. In general, books in both classes have cosmetic alterations only - the book's content is the same as the standard edition published that year. Even so, dedicated collectors will most certainly be keen to find such editions to complete their collections. If you know of any other special editions, please let us know. Many copies of the first (and second) edition were boxed and sent to public houses as promotional material and some of these survive intact. In 2007 an edition boxed for Sir Hugh Eyre Campbell Beaver (the founder of the book) was sold on eBay. 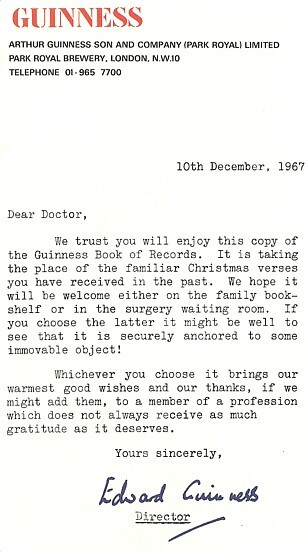 The copy above right was sent to B. Buckingham Esq., "Royal Oak", Park Road, Didcot. It was posted on 30th November 1955, at a cost of 1 shilling and 4 pence. The copy below was sent to Mr. W. C. Kellaway, "The Lamb", Winkton, Christchurch, Hants. on 11th November 1955. 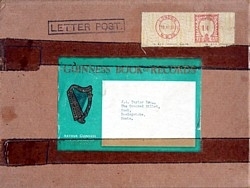 The postage cost was 1 shilling and a penny halfpenny (1s 1½d). We have another copy (below) which was sent to J. A. Taylor Esq., The Crooked Billet, Hook, Basingstoke, Hants. on 18th November 1955. 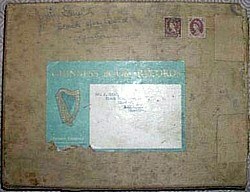 The postage cost was 1 shilling and four pence (1s 4d). 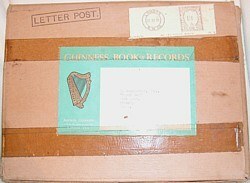 Notes Copies of the editions published in 1964 and 1965 were believed to have been given to Guinness employees in special presentation boxes (below). Similarly boxed editions from other years may also exist. The frontispiece says, "This gift edition has been produced for private distribution only and is not available to the Book Trade nor to the general public". The error in the number of countries in the standard edition has been fixed. The first page says, "This gift edition has been produced for private distribution only and is not available to the Book Trade nor to the general public". There are two slightly different variants of this edition - one has yellow colouring on the spine and a red "The Christmas" logo on the front cover, the other has a graduated orange spine and a graduated colour logo on the front cover. 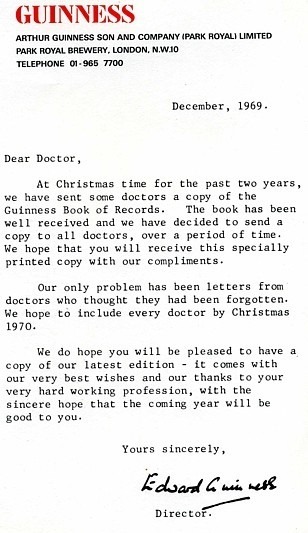 We have a copy with a compliments slip from "Sue Walpole". If anyone knows if Sue was working for Guinness at the time, please let us know. 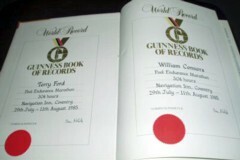 Notes Guinness prepared a dozen copies of the 1988 edition for members of the team that set a world Pool Endurance Marathon record in 1985, but were never credited in the book itself. Notes To mark the printing of the 60 millionth copy of the Guinness Book of Records, a special charity edition was produced. The book was revealed at HMV in Oxford Street, London on Monday 17th October 1988 (at 11AM). Prior to the launch, Norris McWhirter dressed as a bus conductor and travelled in the World Bus (which held the record for driving on its side wheels) to record-breaking sites in London, picking up special guests on the way. The 60 millionth copy was signed by Bananarama, 'Nipper' the HMV dog and other guests. It also contains many pages of pre-printed signatures, and a message of congratulations from Princess Anne. The press release for the launch states that, "The Book will be auctioned in 1989 for Save the Children and Intermediate Technology - the two charities supported by the World Bus". The World Bus (a London Routemaster double-decker) travelled through 18 countries between November 1988 and December 1989 to set a new record and benefit the chosen charities (see page 116 of Edition 37). 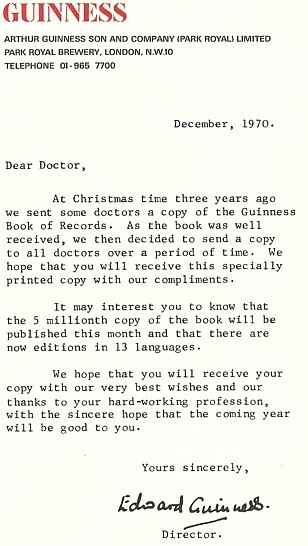 The fourth issue of the Guinness Gold Club newsletter says that, ironically, the book was bought by "the World's greatest salesman" for £60,000. The 60 millionth copy was rediscovered in 2013, with a dedication to "Gordon from Edna and Jack 30.4.90". Notes The mock-up has a plain white cover to which a paper copy of the final cover has been glued. Inside there is a subset (16) of the real pages, repeated 18 times. No actual record text is present and the final pages are quite different to the versions included in this mock-up. Our copy was one given to Hasbro as part of some discussions between the two companies. It also contains an information sheet (below, left) with specification details of the final version. Notes To mark the printing of the 100 millionth copy of the Guinness Book of Records, a special commemorative copy was produced. Presented in a velvet-lined box, the book was signed by all of the book's editors (as of 2004) and by 50 or so record breakers. 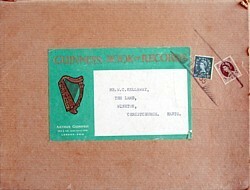 To show the provenance of the special edition, Guinness issued a certificate which states that, "This is the original signed copy of the 100 Millionth Guinness World Records Book, first published in 1955". Notes Some copies of the mock-up for the 2005 (50th Anniversary) edition have survived. 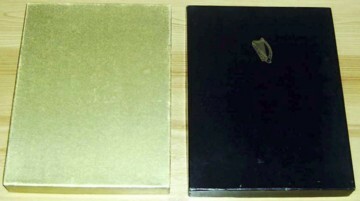 As can be seen from the photos, the prototypes have an impressed gold cover similar to the silver 46th "Millennium" Edition. For whatever reason (possibly the cost of production), this cover was dropped in favour of the "holographic" gold cover of the final version. The mock-up has a subset of the real pages, repeated about 18 times, though the final pages are very different to the early versions included in this copy. The pictures below show the differences between the final version (left) and mock-up (right). Notes Some copies of the mock-up for the 2006 edition have survived. The mock-up copies are subtly different to the final production copies. The mock-up has a subset of the real pages, repeated about 18 times; the final pages are subtly different to the early versions included in this copy. Notes James McConnell sent us a photo of a paperback pre-production mock-up of the 54th edition. Again, the mock-up has a subset of the real pages - two sets of 11 pages repeated, and a single fold-out. The picture below shows the differences between the final version (left) and mock-up (right). Advertised as a limited edition facsimile (reprint) of the 1st edition from August 1955, five thousand copies, individually numbered by hand were produced. Actually, whilst the acknowledgements page matches that of the 1st edition, the rest of the book appears to be a reprint of the 3rd Edition (1st Edition, 3rd Impression). Each copy has a slip-case with the same design as the book's cover. Notes A sample of some of the trial covers for the 2010 edition. Notes A trial cover for the 2011 edition. Notes A trial cover for the 2012 edition. Notes A sample of some of the trial covers for the 2013 edition. Notes A trial cover for the 2014 edition. Notes A trial cover for the 2015 edition. Notes The mock-up copy of the 2015 edition has a different GWR logo on the front cover, different text on the front and back covers, and has a 32-page subset of the real pages (and some publicity information) repeated 8 times. Notes Featuring notable records for every year from 1954 to 2014, and 6 long-standing records. We also have a hardback copy of the German edition, entitled "Happy Birthday"
Notes The mock-up copy of the 2016 edition has a slightly different title orientation on the front cover, different text on the back cover, and has a 16-page subset of the real pages (and some publicity information) repeated 16 times. Notes The mock-up copy of the 2017 edition has a 16-page subset of the real pages (and some publicity information) repeated 16 times. We also have the soft-covered blad for the 2017 edition.